Ferruccio Sardella's flourishing Watershed Wall adds a touch of green beauty to the Evergreen Brick Works in Toronto, but it also boasts a cool secondary function. 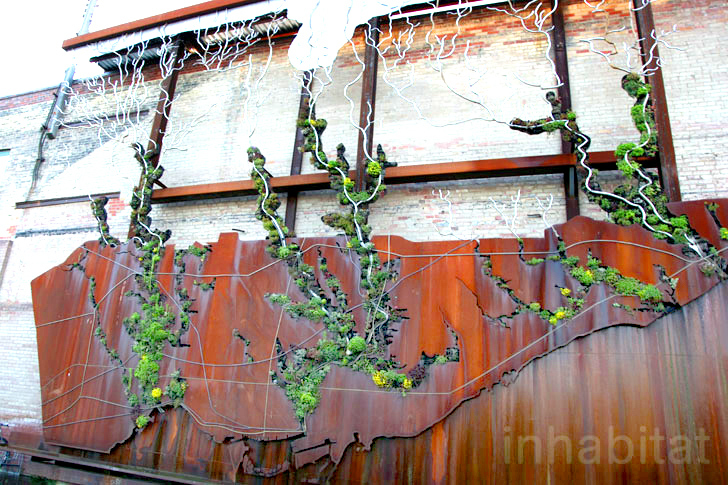 The wall is a map of the rivers, creeks and ravines that run through they city, and as water drips down through a series of tubes and pipes, it waters the plants that fill the miniature waterways on the steel wall. Toronto’s ravines are one of the city’s most distinctive geographical features; the network fans out across the city, and most of them have remained as undeveloped green space. Toronto residents have fought to protect the ravines, and because many of them have never been developed, they often exist in something close to their natural state, and they’re an important part of the city’s fabric. For those reasons and others, Sardella chose to celebrate the ravine system with the watershed wall, which maps the city in a different way than most people probably visualize it. “The whole purpose of the artwork is to re-connect us to the watersheds that sustain us – to look at a map of Toronto from a different perspective and raise our water consciousness,” said Sardella at a ribbon-cutting ceremony in 2010. The wall is an appropriate installation for Evergreen Brick Works, a former brick factory located in the heart of the city’s ravine network that has been converted into a thriving cultural and environmental hub. The Evergreen Foundation has worked to promote and protect healthy wetlands, and Evergreen Brick Works features programming that focuses on Toronto’s ravines. Toronto's ravines are one of the city's most distinctive geographical features; the network fans out across the city, and most of them have remained as undeveloped green space. Toronto residents have fought to protect the ravines, and because many of them have never been developed, they often exist in something close to their natural state, and they're an important part of the city's fabric. For those reasons and others, Sardella chose to celebrate the ravine system with the watershed wall, which maps the city in a different way than most people probably visualize it. Toronto's ravines are one of the city's most distinctive geographical features; the network of ravines fan out across the city, and most of them have remained undeveloped green space. Toronto residents have fought to protect the ravines, and because many of them have never been developed, they often exist in something close to their natural state, and they're an important part of the city's fabric. Artist Ferruccio Sardella chose to celebrate the ravine system with the watershed wall, which maps the city in a different way than most people probably visualize the city. "The whole purpose of the artwork is to re-connect us to the watersheds that sustain us – to look at a map of Toronto from a different perspective and raise our water consciousness," said Sardella at a ribbon-cutting ceremony in 2010. The wall is an appropriate installation for Evergreen Brick Works, a former brick factory located in the heart of the city's ravine network that has been converted into a thriving cultural and environmental hub. 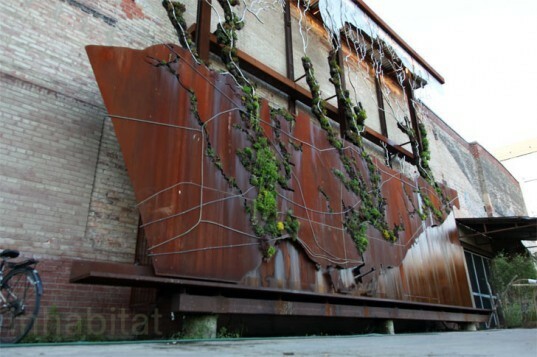 The Evergreen Foundation has worked to promote and protect healthy wetlands, and Evergreen Brick Works features programming that focuses on Toronto’s ravines.